At the 1937 meeting of the Appalachian Trail Conference in Gatlinburg, Tennessee, Myron Avery was able to finally announce that the Trail would shortly be completed. After 12 years of labor, there would at last be a continuous footpath through the wilderness from Mount Oglethorpe in Georgia to Mount Katahdin in Maine. Now that the great task of building the Trail from one end to another was complete, Avery urged the delagates at the meeting to turn to two new tasks: the preservation of the "Trailway" route and the construction the "continuous chain of shelters" from one end of the Trail to the other, located at convenient distances for hikers as they passed up and down the Trail. MacKaye had advocated for just such a chain of "shelter camps" in his original proposal for the Trail and Avery's determination to turn toward building a chain of shelters showed that despite their differences, MacKaye and Avery not that far apart in their vision for how the Trail would be used. Already in 1937, more than 100 such shelters existed. The Appalachian Mountain Club had been maintaining a string of huts in the White Mountains for decades, and as soon as the trail clubs began their work in the mid-1920s, they had also begun building shelters along the trail in their sections. 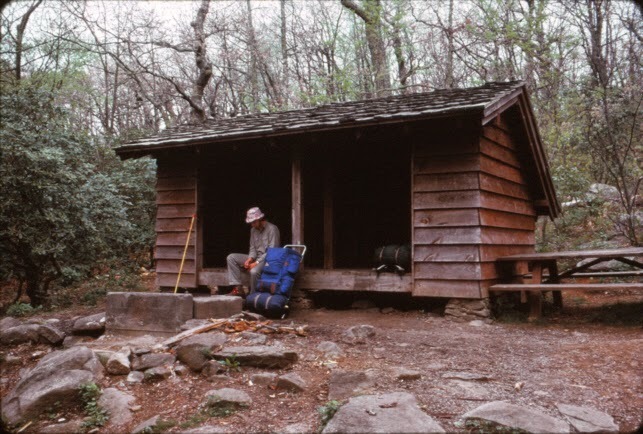 But if the goal was a shelter (a lean-to in the terminology of the 1930s) every 8-10 miles along the Trail, more than 200 would be needed for the 2,000 mile-long route of the AT. 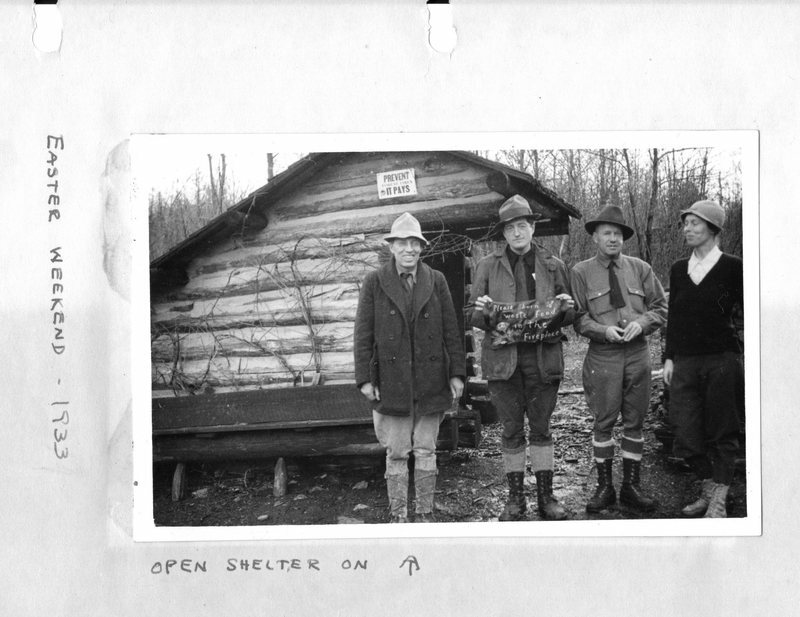 At the ATC meeting in 1937, the various clubs committed themselves to building out a chain of shelters from Georgia to Maine, but they applied themselves to this work with varying degrees of enthusiasm. 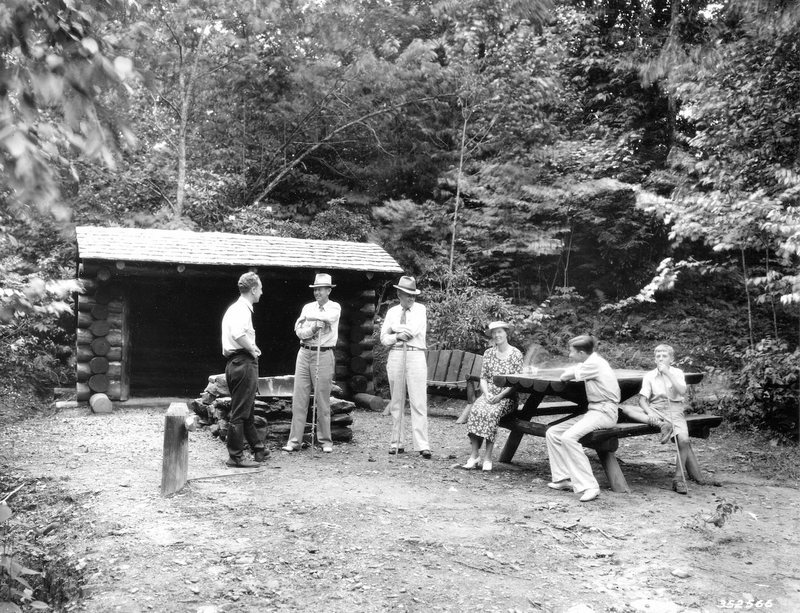 The design recommended to the clubs by the ATC was the "Adirondack Lean-to" that was increasingly popular in national parks around the country. Each of the shelters was to be placed as near to the Trail as possible, as close to a consistent water source as possible, would have a trash pit nearby, and a privy for the disposal of human waste. Many of the early shelters had dirt floors and almost all had wire frame cots with canvas covers. Some had internal fire places, but most had semi-circular fire pits just in front of the structure to provide light and warmth to those inside. A few of the early lean-to shelters were built from stone or a hybrid of stone and logs, but most were constructed of peeled logs cut in the nearby forest, often cut from chestnut trees that had died during the blight of the 1920s but were still standing in the forests. 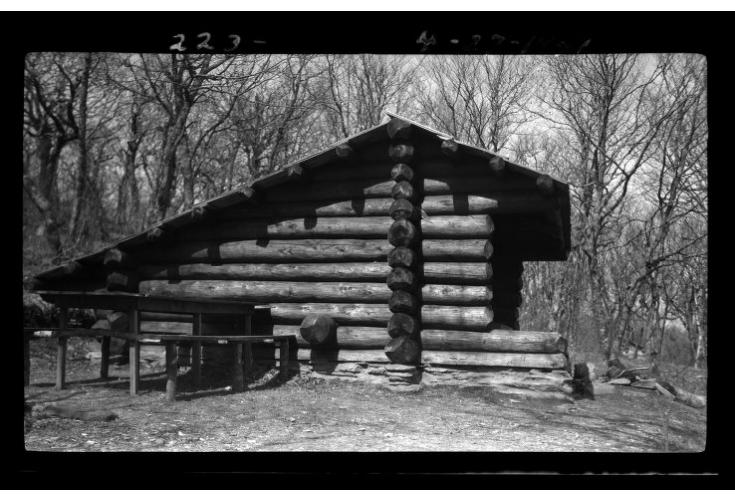 A number of the early shelters were constructed with assistance from local Civilian Conservation Corps units, but the vast majority were built by local trail club volunteers. The vast majority of the shelters along the Trail were open to use by any hiker, although it was expected that they would be used primarily by long distance hikers. Some of the shelters in New England and between the Susquehanna River and the southern boundary of Shenandoah National Park (like the Milesburn Shelter pictured here) had to be reserved and paid for in advance. 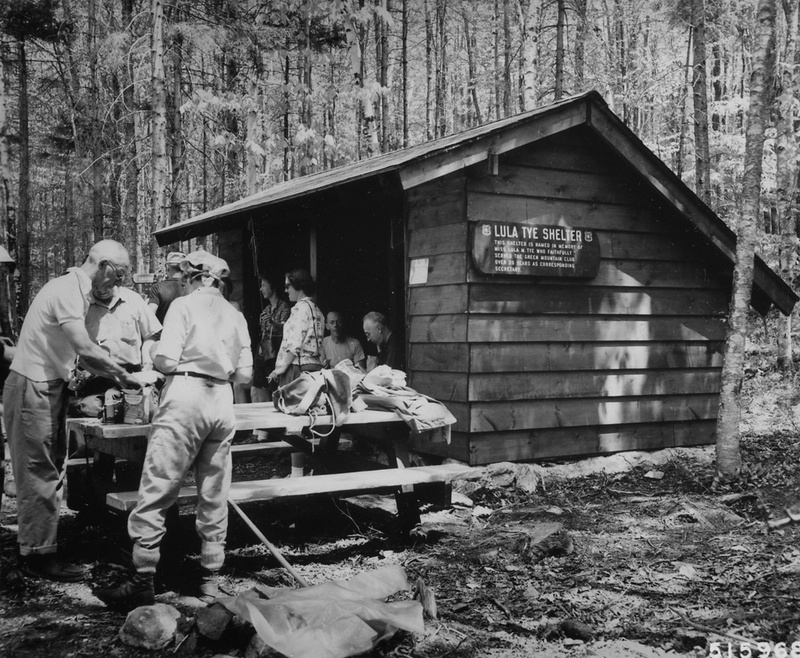 The huts of the Appalachian Mountain Club in New England included a meal with an overnight stay, while the PATC reservation only shelters in Pennsylvania, Maryland, and Northern Virginia provided hikers with pots and pans, beds with mattresses, and other luxuries not available anywhere else along the Trail. It wasn't until the early 1960s that the ATC could at last claim that the continuous chain of shelters first planned in 1937 was completed. Over the decades, shelters have come and gone from the Trail -- some were removed due to relocations of the Trail, others because they were too close to roads and thus became places for local residents to hold parties, others because they simply fell into disrepair and were not replaced. New shelters appear every year up and down the Trail, most of which are still constructed in the Adirondack style favored in the 1930s. In the early 1970s, the ATC and the member clubs considered removing all of the shelters along the Trail due to overuse and a growing problem with hikers leaving mounds of trash at the shelters. Ultimately, the decision was made to remove some of the shelters that were deemed too close to nearby roads and to begin emphasizing what is today known as Leave No Trace outdoor ethics. 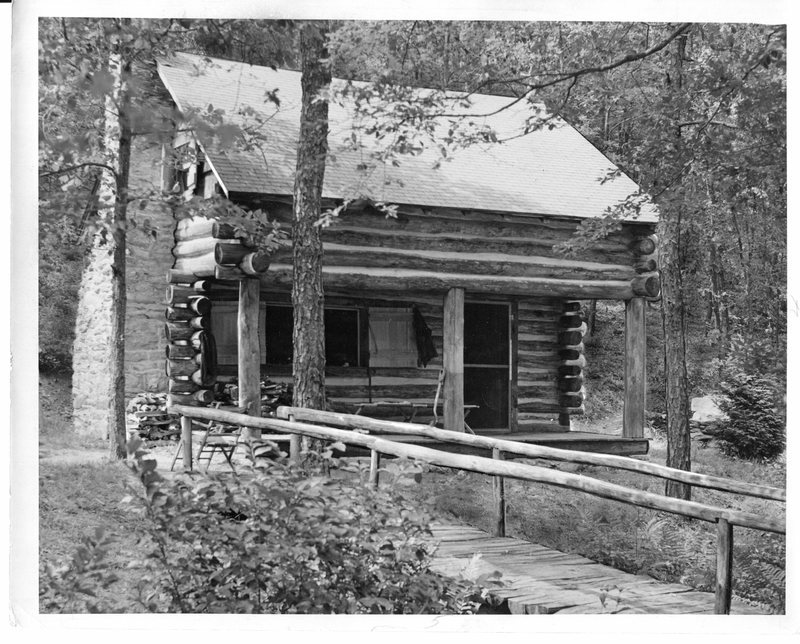 Despite these problems and the difficulties inherent in maintaining wooden structures in the forest, all along the Trail these shelters have been and continue to be, as Benton MacKaye intended, places where hikers and trail volunteers can meet, rest, make friends, and shelter from the elements.